Not only did this guy go head to head with a wood chipper (literally), but after he woke up from the first beating, we’re pretty sure he got back up and tried his luck at round two. Luckily the typically merciless machine to trees felt a little sorry for the old chap and left him a couple tufts of his gorgeous hair, and about one and a half eyeballs to walk around with. Either way, this should be a warning for anybody who decides that opening an underground man vs. heavy power tool fight club should reconsider their rule book. Not only not talk about it among their inner circle, they should also keep that wonderful little idea within the confines of their own brain, lest they end up like this sorry guy. 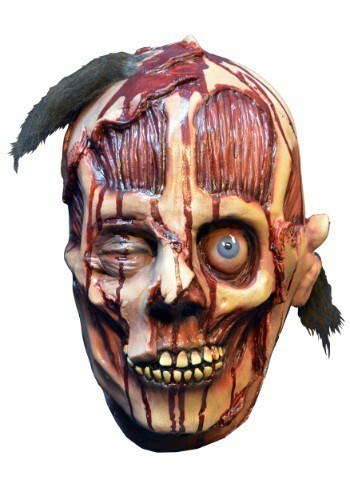 For those of you who think it’s a killer look, this sweet Distortions mask is sure to match your next zombie costume. We can guarantee that it’s going to scare your friends right out of their own skin.